Last year, I planned a storytime that had a lot of the same components as my regular, preschool storytime. It wasn’t really Dr. Seuss-themed so much as a short storytime where I read a Dr. Seuss book. I included a game where I passed out individual cards to the kids with opposite words on them and then I held up one of the cards and had the kids act it out. If they had fast fish, they ran in place. If they had slow fish, they tiptoed. Then we played Simon Says and I let them do a craft that consisted of making their own fish bowl complete with the fish from the cover of One Fish, Two Fish, Red Fish, Blue Fish. I had to cut out 300 tiny fish! Crazy talk! Since it was in the town’s council chambers, I also tried to decorate a little. It was so half-hearted. I am so much wiser this year. This time I figured out my schedule with nuances I didn’t understand before. I thought about time for bathrooms and walking back and forth from the school. I thought about time taken to pass things out and possibilities for distraction. So this year, I planned a 30 minute mini-event around One Fish, Two Fish, Red Fish, Blue Fish. 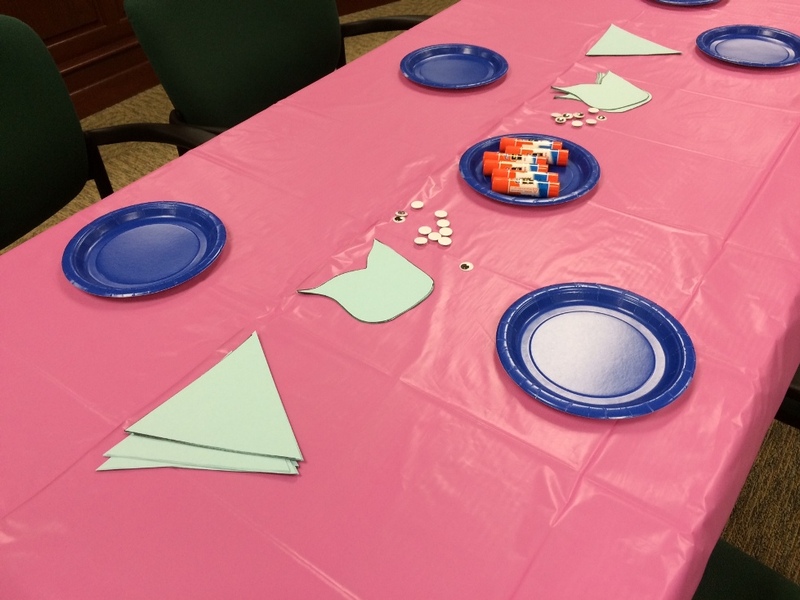 I decided to do a few ocean-themed activities with the short storytime and I had another, simpler fish craft ready. There would be no passing out anything, just one kind of glue would suffice. Before the group came, I timed reading the book for five minutes and remembered the page I stopped on. When I was reading to the kids, I stopped on that page to make sure I didn’t go over my 30 mins for the whole event. 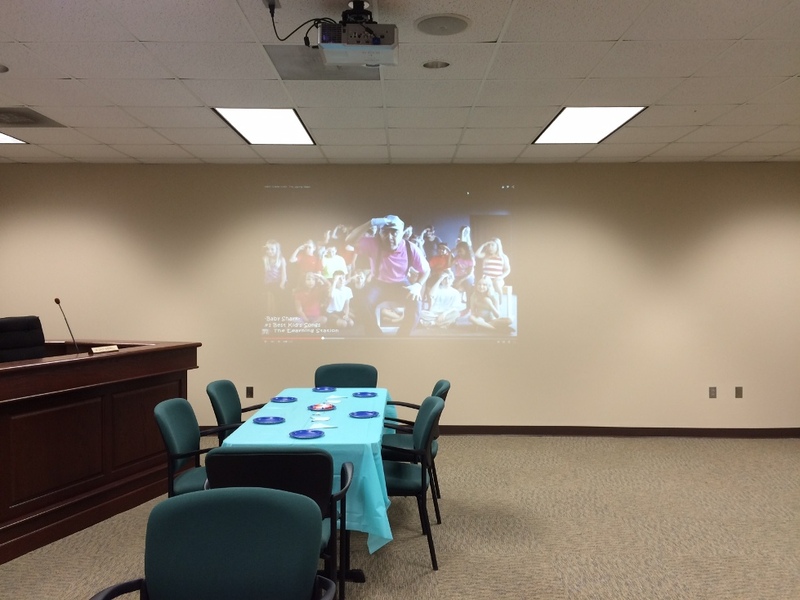 I tried something new with this group and projected the ebook onto the wall to read. 2/3 of the classes really liked it, but one group seemed indifferent. After storytime, I had them sit down for a craft where we made a fish out of a plate. I made one fin and one tail for each child beforehand (150 big pieces instead of 300 little ones). I also had one eye and one glue stick for all the kids. I kept it really simple so I could walk the whole class through making one step by step. And I’m a little proud to say that I reached out to the city manager and invited her and her team to speak to the kids for a few minutes. This branch is connected to Town Hall and we have a lot of our events in their council chambers. Since the city just hired a new city manager a month ago, I’ve made it my mission to include her in what the library is doing as much as possible so that she can witness how much we work with schools and daycares and start to build relationships with them, too. Embracing the chance to talk to kids in their space, they chose to give a short message about recycling and gave their teachers stickers for them to take home. I tied this in by saying how important recycling is to keeping our oceans clean and animals safe. Overall, this was a much smoother program than last year and the kids all had a good time, with lots of them promising to come back.